Made with 24k medium sized medallions, and 14k backs. 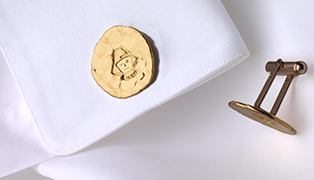 Each medallion cufflink is roughly the size of a nickel and approximately 8 grams. Scarecrow Medallion Ring also available by special request; contact Mimi.